On hand as honorees, Beyonce and Jay-Z attended the 30th Annual GLAAD Media Awards last night(March 28th) at the Beverly Hilton Hotel in Beverly Hills, CA. Naturally they didn't pose on the red carpet but they struck a pose for instagram. 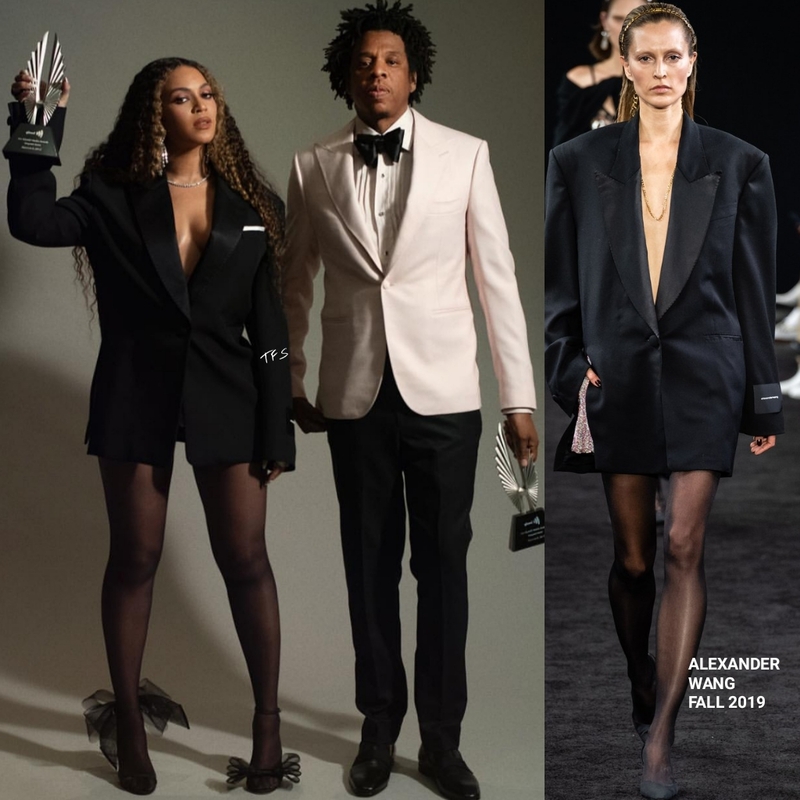 Beyonce posed for the gram rocking an masculine inspired look which featured a ALEXANDER WANG FALL 2019 satin, side split blazer dress, which she styled with sheer black stocking and black tulle panel sandals. The sandals definitely adds a feminine, playful detail to her look. Sparkles came via her statement necklace & earrings which topped off her look along with her signature center part wavy curls. Jay-Z posed for the gram in a tuxedo by his friend and go to suit designer FRERE. His Bespoke tuxedo look featured a white blazer, a pleated bib shirt which was adorned with a black bow tie and black trousers. The trousers could have been hemmed better but I am glad that he wore a white jacket over black.